The next time you ask someone, “What do you think about my business idea?” take a step back first and ask yourself, “What am I looking for?” The underlying question you are asking yourself here is, “Am I serious about entrepreneurship?” It’s a hard question to ask, but an important one. There can be a few things you could be potentially trying to seek through asking people about your business idea, and therefore a few self-assessments you can do in advance to know how to proceed. Let’s first assess if you are motivated to take action, regardless of your current confidence level in the business idea. What would it take to start working on your idea? Have you started putting together real plans to put this into action once the idea gets validated enough? Next, assess your confidence level in your business idea. What answer are you looking for from people when you ask them for their reactions? How many people would it take saying it’s a good idea for you to take action on it? 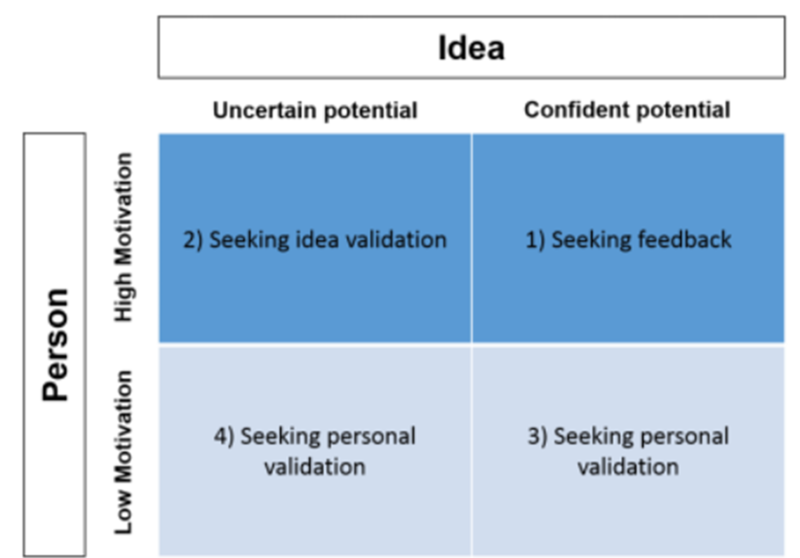 These can help you assess your motivation level, as well as confidence in the idea, which can then help you determine where you fall in what you are trying to seek by asking people about your business idea. Confident in your idea and highly motivated to act on it: this is the sweet spot where you are seeking feedback to be able to best act on your idea – keep it up! Uncertain of your idea and highly motivated to act on it: you are seeking validation for the idea. Be aware of how you ask about the idea to not be too leading. Make sure to ask open-ended questions to be open-minded about how best to be solving real needs and filling gaps in the market, versus just trying to lead people to tell you what you want to hear. Confident in your idea but will likely not act on it: if you’ve asked yourself how many people it would take to say they love your idea to take action, and no amount seems to suffice, then why do you continue to ask? Are you hoping someone will think it’s a great idea and want to buy it from you? Because sorry, but ideas are cheap – it all comes down to execution. Uncertain of your idea and will likely not act on it: similar to the above, ask yourself why you are asking people about it. It can sometimes be a learning experience in this category, but can also be similar to the above. For both of these, ask yourself what it might take to be more passionate about your idea to move to the category of wanting to act on your ideas. Are you missing some skills you can acquire or bring on co-founders? Should you choose ideas you are more excited about? In summary, know why you are asking people for their input based on where you are in your entrepreneurial process as a potential entrepreneur and with your particular idea, so you can best take their input and learn from it professionally and personally.